We will take you on a beautiful picturesque tour of Prague by classic convertible vintage car. Sit in the warm summer air while we show you Prague from the comfort of this classic vintage car. The full day walking tour of Prague with vintage car will last 7 hours. 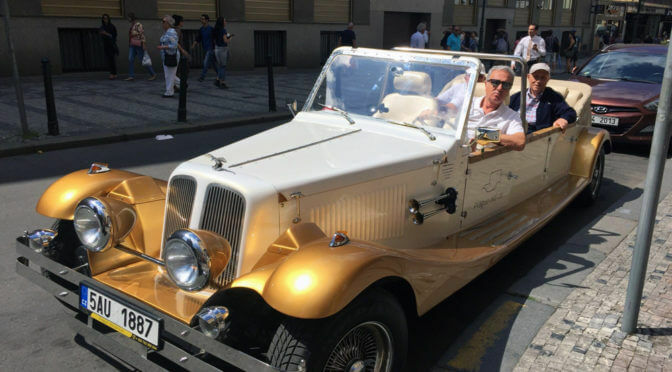 The first hour we will take on a special ride through Prague and see the city first hand from your choice of vintage cars Model T Ford or Vintage Alfa Romero Convertible Spider. After the car sightseeing tour we will be dropped at Prague Castle were we will begin our full of 1/2 day walking tour of Prague. The vintage car last 1 hour and is combined with either our full day tour or our 1/2 day tour. This is a great combination package. You get to experience it all in Prague by car and by foot together in one day. Can be booked in summer and winter months.